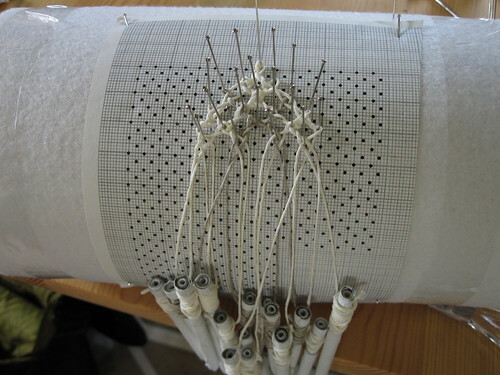 In the workshop we will quickly introduce some e-textile projects involving bobbin lace. 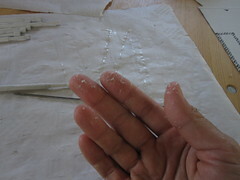 We will show the basic technique as hands-on workshop, which is the basic for (nearly) any pattern later-on. 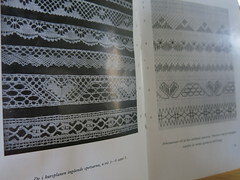 We will bring patterns and samples for everybody who wants to continue immediately or knows bobbin-lace-making already. 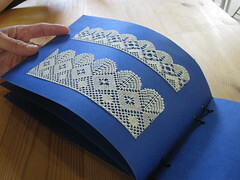 With different conductive materials we will try out and discuss which ways conductive bobbin-lace can be used. 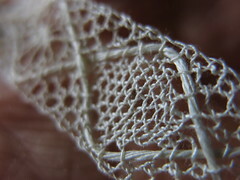 Bobbin-lace making started in the 16th century in Italy. 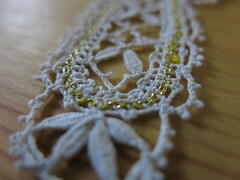 Back then the lace was made with gold and silver-wrapped threads or colored silks and linen threads to create extravagant designs. 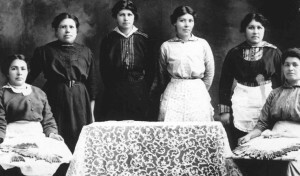 Today, in 2013, we would like to investigate this historical craft tradition and explore technological possibilities we have today. 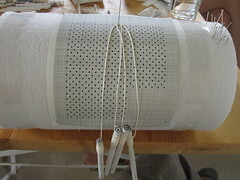 We will use linen thread and conductive silver plated thread, like they did in the 16th century but additionally to pure visual pleasure we will develop this technique for much more functional e-textiles use, e.g. for electrical circuits. 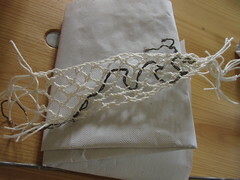 During the bobbin-lace workshop we will teach basics of lacemaking and everyone will make a small sample. 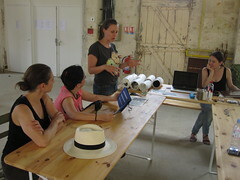 We will introduce briefly the historical laces and also contemporary designers and artists works who work with lace today in fashion and product design and also in architecture. We will also show some samples with more complex designs. Sounds interesting? Then please join our workshop! 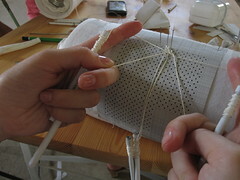 The workshop started with introduction to bobbin lace making, its history and examples of various lace patterns you can make with this technique. 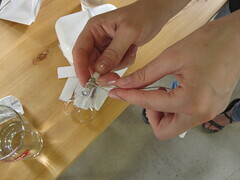 As we did not have bobbin and cushion for all of the participants, we started with making DIY paper bobbins. 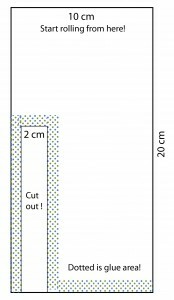 First, cut out the paper as it is marked. 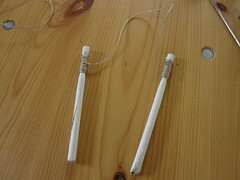 Then roll the paper on a thin metal knitting needle (it can be any thin hard stick, but if you use wood, make sure to not to glue them with paper accidentally). 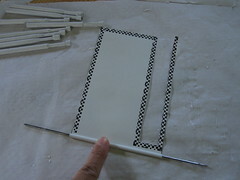 Then place the glue on the colorful dotted part and continue rolling till the end. 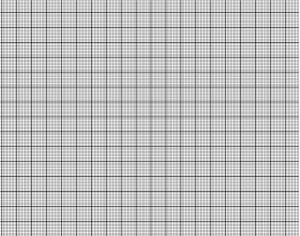 Paperbobbin pattern can be printed or drawn and cut out. You should get something like this. This is one bobbin, and we need 16 of them. 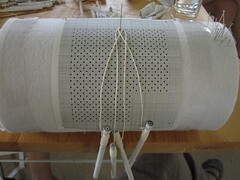 The bobbin cushion is also a DIY version made by the workshop leaders. It is made with tomato can (or any good sized canned food, better filled as it helps to have some weight) as a core, then wrapped around with cotton or some scrap fabric for few times, then wrapped with thick felt to have a stable outer later. 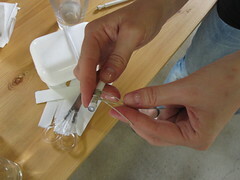 The edges are fixed with a sticky tape. This is a useful tip if you want to do a race making without proper bobbin cushion. NB! 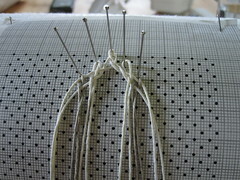 The soft textile layer should be about the 1/2 size of the pins so that it is comfortable to use pins. 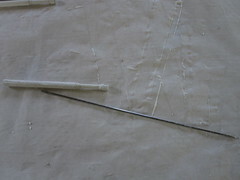 The outer layer should be a textile which can handle stabbing with needles and will not brake. 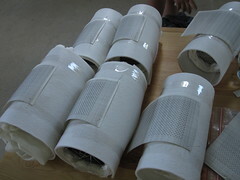 Therefore is the felt material a good solution. 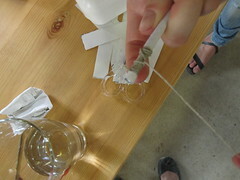 Now we wind the thread on paper bobbin we made. 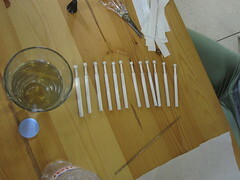 We have 16 bobbins, which makes 8 pairs of bobbins, with 8 threads. Pre cut 8 threads in same length (in this case 1m each), fold it into half and mark the center of the thread. 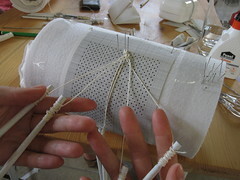 Wind the thread around the thin neck part of the paper bobbin from one edge until 10cm to the center. 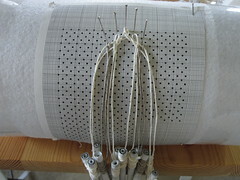 We have used 2 colors of threads, 7 pairs in white and 1 pair in grey. 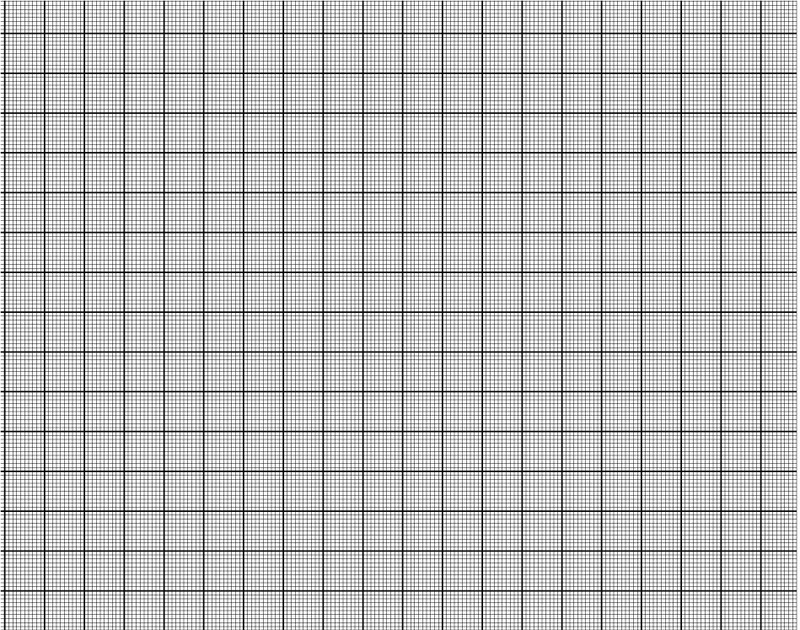 This color setup is good to see how the threads run in the pattern. 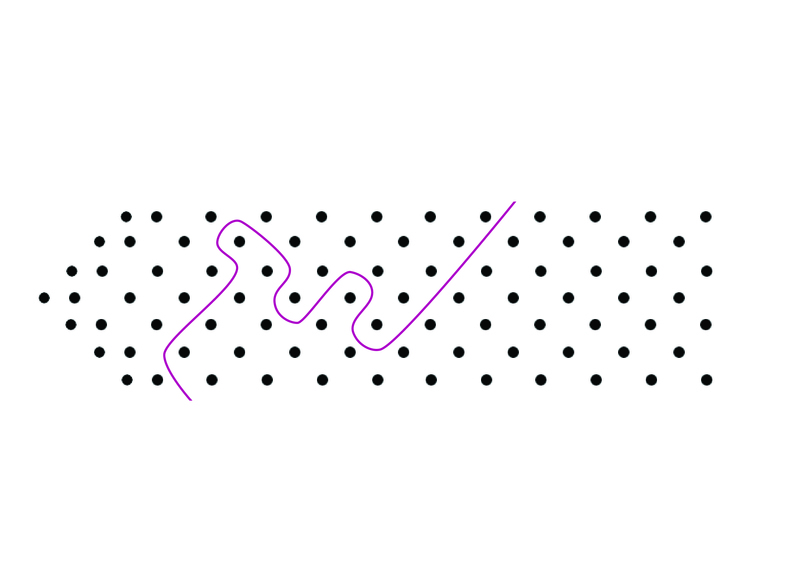 In our pattern the threads make a zigzag. 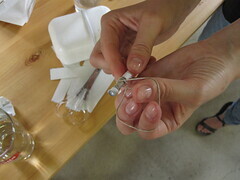 Then you have to do the slip knot so it does not unwind. 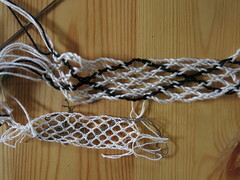 See the picture below for the knotting steps. Repeat it for the other end of the thread. 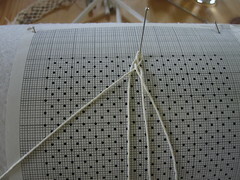 Now you have 2 bobbins on each side of one thread, looking like this. 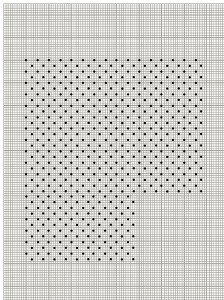 Print a dotted pattern for your lace design where the dots indicate the needle positions. 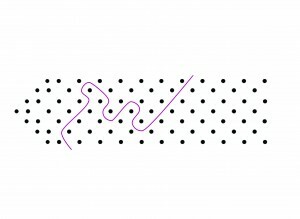 This pattern also shows the insert thread placement in pink color. 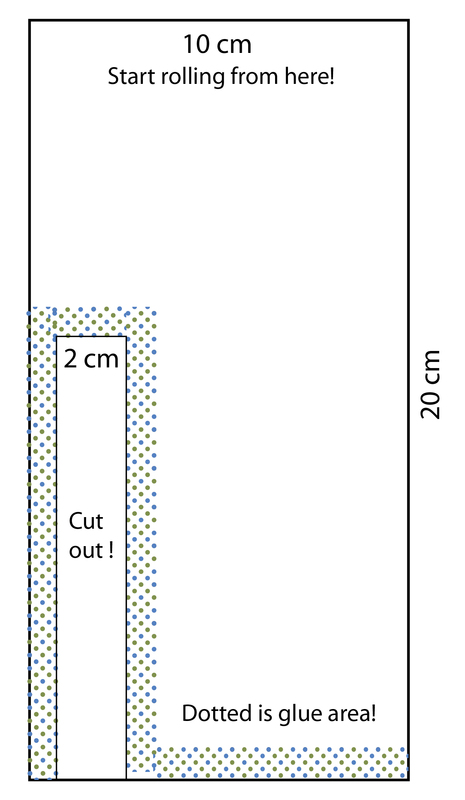 Another option is to use the common grid paper for the pattern. 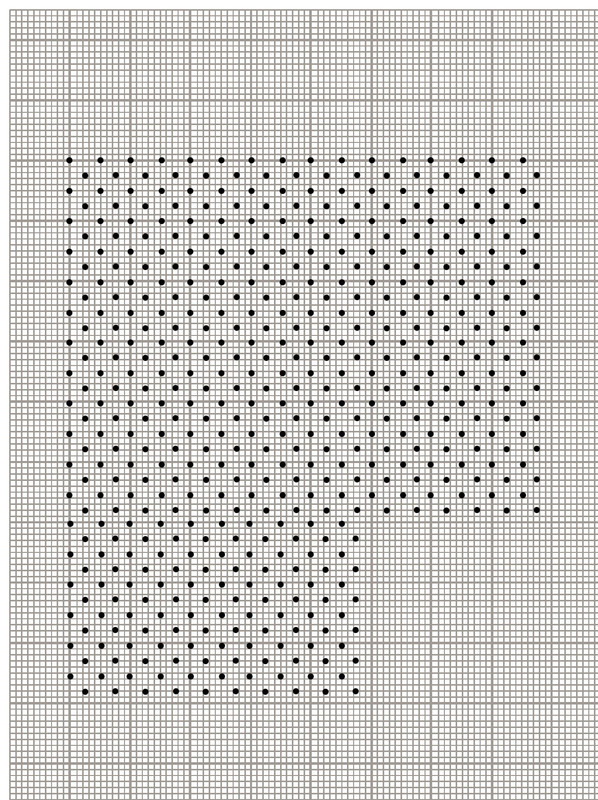 Place one pin on the top center of the grid paper. 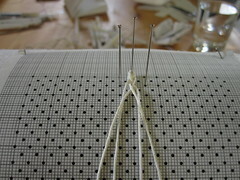 Add two more pins on diagonal corner. 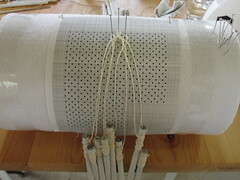 Hang pair of bobbins from each added pin and continue the same set as the first set, but counting bobbins from the left corner. Now you have 8 bobbins, 4 pairs. 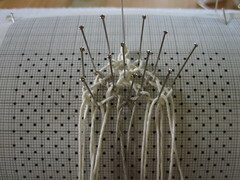 As you finish the set, add pins on the diagonal corner until you add all the 16 bobbins. 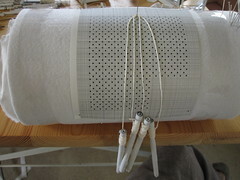 After all the bobbins are added, keep doing the same set from the left end bobbin until you reach the desired length. 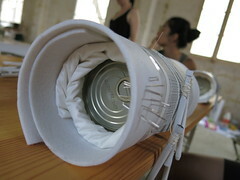 As you continue, turn the cushion (or the can in our case) so the work area stays in front of you. 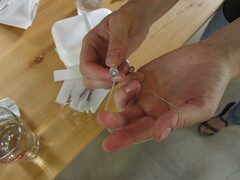 This is important as you want the bobbins to pull the thread down to keep tension on the threads. 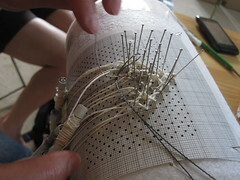 You can insert extra thread, like conductive thread in the lace while making.